Hatred toward First Nations people by the rebels continued to be the norm among the general populace. Most, especially frontiersmen, failed to distinguish between their First Nation allies, their First Nation enemies and the First Nation communities that were neutral and wanting only to sit out the war in peace. In the spring of 1782 the Moravian Delaware were living near their town of Gnadenhutten on the Muskingum River. They had been long converted to Christianity by the Moravian missionaries and had taken up western societies’ ways. They were farmers. They wore European dress and had their hair cropped in European style. They lived in houses rather than lodges. They worshipped in a Christian church on Sundays. Their community functioned under the auspices of their Moravian mentors. The Muskingum had become a dangerous war zone. They realized the danger was particularly heightened for them being “Indians”. They had determined to abandon their farms and move the whole community further west to seek safe haven among the Wyandotte of Sandusky as many of their Delaware brothers who were not Christian had done already. Before they could leave they were approached by Colonel David Williamson and 160 of his Colonial Militia. They claimed to be on a peaceful mission to provide protection and to remove them to Fort Pitt where they could sit out the war in peace. The leaders of the Gnadenhutten community encouraged their farmers to come in from the fields around Salem and take advantage of the colonel’s good offer. When they arrived all were relieved of their guns and knives but told they would be returned at Fort Pitt. As soon as they were defenseless they were all arrested and charged with being “murders, enemies and thieves” because they had in their possession dishes, tea cups, silverware and all the implements normally used by pioneers. Claims that the missionaries had purchased the items for them went unheeded. They were bound and imprisoned at Gnadenhutten where they spend the night in Christian prayer. The next day the militia massacred 29 men, 27 women and 34 children all bound and defenceless. Even pleas in excellent English on bended knees failed to save them. Two escaped by pretending to be dead and fled to Detroit where the story of the rebels’ atrocities were told. The Virginians decided to continue the massacre at Gnadenhutten with a campaign of genocide. The plan was to take the Wyandotte and their allies at Sandusky by surprise and annihilate all of the inhabitants. They gathered a force of 478 men at Mingo Bottoms on the west side of the Ohio River. General Irvine, who had abhorred Williamson’s actions at Gnadenhutten, deferred command of the expeditionary force to Colonel William Crawford. The force left Mingo Bottoms on May 25th avoiding the main trail by making a series of forced marches through the wilderness. On the third day they observed two First Nation scouts and chased them off. These were the only warriors they saw on their 10 day march. Just before they crossed the Little Sandusky River they came unwittingly close to the Delaware chief Wingenud’s camp. Finally Crawford arrived at the Wyandotte’s main village near the mouth of the Sandusky River. He assumed his covert operation had been a success and they had arrived at their objective undetected. But he was dead wrong. His Virgina Militia had been closely shadowed by First Nation scouts and reports of their progress had been forwarded to the chiefs. War belts were sent out to neighboring Delaware, Shawnee and other Wyandotte towns and their warriors had gathered at the Half King Pomoacan’s town. Alexander McKee was also on his way with 140 Shawnee warriors. An urgent call for help had been sent to the British commandant Major Arent S. De Peyster at Detroit. He responded by sending Captain William Caldwell with 70 of his rangers. One hundred and fifty Detroit Wyandotte joined Caldwell along with 44 “lake Indians”. Caldwell complained to De Peyster that “The lake Indians were very tardy but they did have 44 of them in action”. These “lake Indians” were Chippewa warriors from Aamjiwnaang at the foot of Lake Huron. The Aamjiwnaang Chippewa were members of the Three Fires Confederacy and were at Vincennes when they withdrew support from the British in 1779. The fact that they only raised 44 warriors attest to the lack of their war chiefs’ support. They were probably young men incensed by the stories of Gnadenhutten and acting on their own. Crawford was dumbfounded when he arrived at the Wyandotte village and found it deserted. He and his officers held council and decided to move up river hoping to still take the Wyandotte by surprise. They didn’t get far when they were met by the warriors from Pomoacan’s town. They were held in check until McKee and Caldwell arrived. The battle lasted from June 4th to the 6th and resulted in a complete First Nation’s victory. The rebel’s expedition to annihilate the Wyandotte ended in disaster for the Virginians. It cost them 250 dead or wounded. Caldwell’s Rangers suffered two killed and two wounded while the First Nations had four killed and eight wounded. Colonel Williamson was able to lead the rebel survivors back to safety but Colonel Crawford was captured along with some of the perpetrators of the Gnadenhutten massacre. They were taken to one of the Delaware towns where they were tried and sentenced to death. Their punishment for Gnadenhutten atrocities was not an easy one. In 1778 the British send 200 of Colonel John Butler’s Rangers into the Wyoming Valley to evict 6,000 illegal immigrants who were squatting on “Indian lands”. They had with them 300 of their First Nation allies mostly members of the Three Fires Confederacy. The Wyoming valley was situated in the middle of the Seneca’s best hunting grounds and land never ceded by them. Most of the forts the illegals had built were quickly abandoned and the inhabitants fled. Fort Forty was the lone exception. When the warriors feigned a withdrawal the colonials foolishly poured out of their fort and into an ambush. This resulted in the killing of 227 of them. The Revolutionary government turned to propaganda releasing a series of outlandish stories of the “massacre””. One such story read that it was a “mere marauding, a cruel and murderous invasion of a peaceful settlement…the inhabitants, men women and children were indiscriminately butchered by the 1,100 men, 900 of them being their Indian allies”. In truth there was only 500 men, 300 of them being their First Nation allies. And according to an exhaustive study done by Egerton Ryerson only rebel soldiers were killed and the misinformation put out by the Congress Party was totally exaggerated and highly inflammatory. Colonial propaganda was designed to inflame hatred among the populace toward the British’s First Nation allies. However, it had the effect of inflaming hatred toward all First Nation’s people due to the decades of violence along the frontier over land. The frontiersmen were convinced they had the right to push ever westward while harboring in their hearts the axiom “the only good Indian is a dead Indian”. General Washington bought into his own government’s propaganda releases. In 1779 he decided to act. The Six Nation Iroquois League was divided on where their loyalties lay. Only the Oneida and Onondaga backed the rebel cause and even their loyalties were split. Washington charged General John Sullivan with a war of extermination against the Iroquois. Sullivan headed into Iroquois territory with an army of 6,500 men. His war of extermination was a failure but he did destroy forty Seneca and Cayuga towns along with burning all their crops. Although it is true that atrocities were committed by both sides those committed by the rebels were mostly forgotten. During this campaign the Iroquois dead were scalped and in one instance one was skinned from the waist down to make a pair of leggings! The famished Iroquois fled to Niagara where they basically sat out the rest of the war. With their crops destroyed the British supplied them with the necessities putting a tremendous strain on their war effort. This expedition earned George Washington the infamous nickname of “Town Destroyer”. Now not only was any hope gone of assistance from the Shawnee but also the Iroquois. Meanwhile, in Illinois country George Rogers Clark was determined to retake Fort Sackville at Vincennes. He had captured it the year before only to lose it to Colonel Hamilton who had marched immediately from Detroit. He left Kaskaskia on February 5th marching his 170 militiamen across flooded plains and waist deep, freezing water. When he arrived at Vincennes he used the old dodge of marching his men across a small patch of tableland visible to the fort. He repeatedly marched them across this plateau giving the enemy the impression that he had many more men than he actually had. The history books claim that this had such an alarming affect on the First Nations at the fort that they were “scared off” by the ruse and the fort fell immediately. It is true that the British were abandoned by their First Nation allies. They were members of the Three Fires Confederacy. It is not true that they were “scared off”. Of the 170 militiamen with Clark some were Frenchmen from New Orleans. The French, like some of the First Nations, were also split in their allegiances. Captain Alexander McKee wrote to Captain R.B. Lernoult quite worried about news he had received regarding Three Fires support. In the letter he wrote that the Ottawa and Chippewa had sent a belt of peace to other surrounding nations saying they had been deceived by the British and the Six Nations into taking up the hatchet against the rebels. If they remained with the hatchet in their hands they would be forced to use it against their brothers the French. They reported seeing them coming with Clark and his Virginians and therefore withdrew as they still had great affection for the French. Old loyalties die hard. They were determined now to lay down the hatchet and remain quiet thus leaving the whites to fight among themselves. They were advising their brothers the Shawnee to do the same and that the tribes of the Wabash were also of like mind. This was not good news for the British. The withdrawal of support from the Three Fires Confederacy and the sidelining of the Six Nations Iroquois that year left the British with only support from the Miami, Shawnee and some of the Delaware. There would be more atrocities to follow but still it would be another three years before the British would see any Three Fires’ support. The American Revolution broke out in 1775. At first neither the British nor the colonial rebels showed any interest in drawing on any First Nations support. The First Nations around the Great Lakes basin also had little interest in getting involved. Most saw it as a ‘white man’s” squabble. The more vocal ones advised neutrality saying ‘let the father chastise his rebellious son”. But after the war dragged on for two years each side began to look for the help of their First Nation allies. It had become most important for the British to protect the frontier. Ohio country was strategically crucial so a tug of war arose between Colonel Henry Hamilton the British commandant at Fort Detroit and George Morgan the Colonial Indian Agent at Fort Pitt for First Nations’ allegiance along the frontier. The following spring Hamilton called a council at Detroit. Over 1600 First Nations people gathered there in June of that year. The presents flowed liberally including liquor. Of the 8,750 gallons of rum shipped to Detroit for the first six months 8,250 gallons were allocated for the “Indians”. On June 14, 1778 the council began. Both Civil and War chiefs from the following nations: Ottawa, Chippewa, Potawatomi, Wyandotte, Delaware, Mohawks and Seneca . Heading the list of nine war chiefs of the Chippewa was my great-great-grandfather Little Thunder. He had been presented with a British Brigadier Generals dress and a King George III medal for service at Fort Sinclair on the St. Clair River in the late 1760’s. He coveted those items and I imagine him to be an impressive sight arriving at the council in his headdress, bright red tunic and large King’s medal hanging around his neck. Simon Girty, the infamous colonial traitor, acted as one of eight interpreters. Girty “having escaped from the Virginians and having put himself under the protection of His Majesty, after giving satisfactory assurance of his fidelity” was looked upon by the British as a loyalist. One man’s renegade is another man’s partisan! Chamintawaa, an Ottawa civil chief, spoke for the Three Fires Confederacy. He promised Hamilton to continue to ignore poor advice saying “bad birds come about us and whisper in our ears, that we should not listen to you, we shall always be attentive to what you say”. But the bulk of his speech was directed to the Delaware. “Listen Brethren! I am going to say a few words to our Grandfathers the Delawares in the name of all the nations here present, I speak in the name of their War Chiefs”. Chamintawaa took them to task for not being wholeheartedly in unison with the other First Nations. He accused them of “breaking down branches from the trees to lay across our road, at the same hanging down your heads with tears in your eyes”. He asked them to be united and “listen to our father as we all do & obey his will” and not to “take your hearts to the Virginians”. Chamintawaa ended his speech with the warning, “this is the last time we intend speaking to you”. The Delaware did not answer until the conclusion of the council. War Chief Captain James said he could not speak for all the Delaware but only for his village. He said he was entirely on side and to prove his words he “sang the war song and danced the war dance” on the belt he was given. However, three Delaware chiefs who were not at the council, Captain Pipe, Captain White Eyes and John Kill Buck Jr. signed a treaty with the Revolutionary Government at Fort Pitt in September. The British were much more adept at raising First Nations’ support than the colonials. They had a well experienced Indian Department in place and had been practicing the policy of present giving for more than a decade. This had gone a long way in cementing good relations and alliances. On the other hand, the colonials had only decades of land grabbing and violent squabbles with their First Nation neighbors. The Shawnee had become divided in 1778. The chiefs were opposed to joining the war but their warriors had become increasingly rebellious. Many ignored the prompting of their chiefs and clamoured for war. A group had already accepted a war belt from Hamilton at Detroit and joined in the raids on the frontier. By autumn the celebrated chief Cornstock had decided to accept a Delaware offer to move his village to their capital town of Coshocton for safety. But before the move Cornstock along with chief Red Hawk and warrior Petalla visited Fort Randolph on the Kanawha River. They had made the trip to advise the Continental Army of the disposition of the Shawnee nation. Cornstock told the commander, Captain Matthew Arbuckle, that despite all his efforts to keep the Shawnee neutral the tide against the rebels was so strong that their warriors were being swept up in the current. When Arbuckle heard this he decided to take the three hostage. Shawnee neutrality would be their ransom. After about a month in custody Cornstock’s son, Elinipsico, came to see what happened to his father. Just as they were visiting the body of a young frontiersman was brought in. He had been mutilated and scalped. The undisciplined militia was incensed and wanted to take revenge on the four Shawnee inside the fort. Arbuckle and visiting Colonel Charles Stewart were helpless to stop them. Cornstock and his son died in a hail of bullets while Red Hawk was gunned down trying to escape up the chimney. Petalla died in agony after being severely mauled. Needless to say this ended any hope of securing an alliance with any of the Shawnee. Nimwah, Kishanosity and Oweeconne moved Cornstock’s village of seventeen families to Coshocton where many First Nations people who wished to remain neutral were gathering. 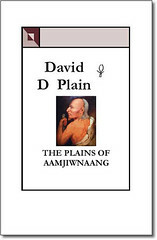 You are currently browsing the Books by David D Plain Blog blog archives for June, 2011.